THE Committee of Youth on Mobilisation and Sensitisation (CYMS), an NGO, has expressed optimism that President Muhammadu Buhari would be re-elected on Feb. 16. 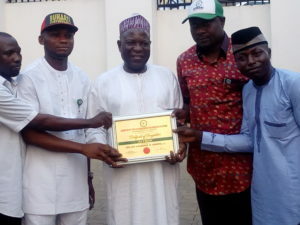 The Chairman, CYMS Board of Trustees, Mr Festus Uchenna, expressed this view when the committee issued Certificate of Recognition to Sen. Abubakar Sodangi, as the CYMS Patron, Nasarawa State Chapter, on Wednesday in Abuja. Uchenna said that he believed that Nigerian youths would re-elect Buhari for his personal qualities, which include integrity and his administration’s policies that were in favour of the future generation of the country. He advised all Nigerian youths to support the re-election of Buhari, saying they should cast their vote for Buhari to enable him to consolidate on his achievements. “In leadership we shouldn’t be thinking of money all the time. We need to change the narrative. “Do not vote for money, because after elections there will still be life. “Buhari is a man of integrity, a man that wants to serve and a man with the mind set of the People. “Before now, people were moving around begging for money, but now people are beginning to build fish ponds, going into farming, they are beginning to be serious and change their mindset because there is no more illegal money to be shared,” he said. The Director-General, CYMS, Mr Obinna Nwaka, said that following the anti-corruption crusade of Buhari, transparency has become the watchword of Nigerians. “Do not think that you can go and relax because Nasarawa state is being controlled by the ruling party. You need to put in all the required strategies. He said that nomination of Sodangi was approved by the Committee’s National Executive Council, based on his history and his antecedents. Sodangi, former Senator for the Nasarawa West constituency, commended the committee for counting him worthy to be the Nasarawa State chapter’s grand patron. He pledged to mobilise Nasarawa youths to work for re-election of Buhari. “In Nasarawa many youths have keyed into the call by the President to go back to farm. “We have the land, the water and the dam. In Nasarawa we have where rice is being cultivated. He noted that with Buhari policies, untapped resources in the state would be soon harnessed. He added that Buhari has achieved three key programmes, fight against corruption, security and and economic development. Mr Kelechi Ugwumba, CYMS’ Director, Contact and Mobilisation expressed confidence in the ability of Sodangi to mobilise Nasarawa youths.